-Perhaps the most interesting UDFA signing was Miami inking Delaware QB Pat Devlin, a former Penn State player who transferred to I-AA/FCS Delaware in early 2009. It looked like Devlin would be selected in the 2011 NFL Draft, but he had a horrible Pro Day, one that was so bad that it caused him to fall all the way out of the NFL Draft. Devlin was the #1 pick in the 2011 UFL Draft, but with the NFL working out a new CBA, Devlin eschewed his UFL opportunity and instead signed with the Dolphins. With Miami ultimately not trading for Broncos QB Kyle Orton, which was expected but didn't happen, Devlin may have a shot at making the team if he can show that his Pro Day disaster was an aberration. 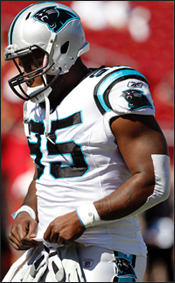 -Charles Johnson received $32 million guaranteed from the Panthers as part of a six year, $76 million contract that Carolina signed him to in order to keep him off the open market. Before the lockout, Carolina rolled the dice on the fourth-year breakout DE star, opting to use the franchise tag on center Jeff Kalil while perhaps hoping that the NFL would either retain the restricted free agent status on fourth-and-fifth year players in free agency (as was the case under the Final Year Rules of the old CBA) and/or negotiate a right of first refusal in the CBA talks for this first year. But that didn't happen, and the Panthers had to break the bank to keep Johnson. Keep in mind that, prior to 2010, Johnson started a total of four NFL games. -Even stranger: the Panthers kept RB DeAngelo Williams off the market, signing the 28-year-old to a five-year, $43 million deal with $21,000,000 guaranteed. It feels so empty to write "$21M" on Twitter (damn their 140 character limit) when all those zeros in front of the word guaranteed has a much stronger visual effect. I understand the appeal of having both Williams and Jonathan Stewart as dual running back threats, and I know that Williams scored 20 touchdowns (18 rushing, 2 receiving) in 2008. But NFL contracts are about perceived potential future performance, not rewarding past accomplishments. Let me ask this: what other team would have given Williams $21,000,000 guaranteed? Or even $15 million guaranteed? Understand that I've been a fan of Williams since his days at the University of Memphis, and I'm happy for him that his agent worked out such a strong deal for him. And this is not to say that Williams isn't a talented running back, but to spend so much money to keep him on the roster, when a running back for literally half that price (if not more) would likely provide comparable results in a supporting role behind Jonathan Stewart, leaves me baffled. I realize that Panthers GM Marty Hurney faces pressure to get Carolina winning again -- and fast. They canned the former coaching staff after last season, and if the Panthers struggle in 2011 and 2012, it might be easy for Panthers owner Jerry Richardson to show Hurney the door. But giving out guaranteed money like he's living a remake of Brewster's Millions is not advisable. I understand that Carolina didn't want to face what Buffalo has with free agents using them to drive up their market price before signing elsewhere, but this crazy spending of guaranteed cash could come back to haunt the Panthers. Don't say you weren't warned, Carolina fans. One more downer for the Panthers: they reportedly shopped WR Steve Smith for a 3rd round pick and found no takers. Why? Not much demand for a 32-year-old 5'9" WR who had just 554 receiving yards and 2 TDs in 14 starts in 2010. I know Carolina's QB situation was bad last year, but compound that with Smith's remaining base salaries ($7M this year and $7.75 million for 2012) and you can understand why teams weren't clamoring to give up a draft pick to get him. -On the other side of the financial category was Philadelphia signing former Raiders CB Nnamdi Asomaugh (nahm-DAY AUS-um-wah) to a five-year, $60 million deal with only $25 million guaranteed. Guaranteed money is EVERYTHING; just ask CB Nate Clements, who left Buffalo in 2007 and signed a huge-looking eight-year, $80 million deal with the 49ers. $80 million sounds like a ton of cash, but it's the guaranteed part (which for him was $22 million) that is the most important element of any NFL contract. Think I'm wrong? The 49ers cut Clements this week after just four years of that eight-year contract had been completed. To be sure, eight years and $80,000,000 sounds good, but if it's not guaranteed, it's immaterial. People have taken to calling Philadelphia the "Dream Team" (no, not Brutus Beefcake and Greg Valentine) with the team signing Asomaugh, Vince Young, Jason Babin, and even possible role-player types like TE Donald Lee (fresh off a Super Bowl win with Green Bay) and WR Johnnie Lee Higgins, plus adding former Pro Bowl CB Dominique Rodgers-Cromartie. Even if Philly ships Asante Samuel, they already have a loaded nucleus and an extra second-round pick for 2012. It's enough to get the typically cynical Philadelphia fan base excited, which is saying something. Late tonight came the final big name left on the market to sign, with the Jets retaining CB Antonio Cromartie with a reported four-year, $32 million deal. No word as of this writing on how much is guaranteed, though that news should be coming soon enough. There is much, much more to analyze, but these are the high spots. The QB musical chairs deserves a long overview, which I plan to give it. And now, with much of the uncertainty gone about who would be going where, better analysis looking ahead to the 2012 Draft should be possible, though we are very far away from that point as of now.